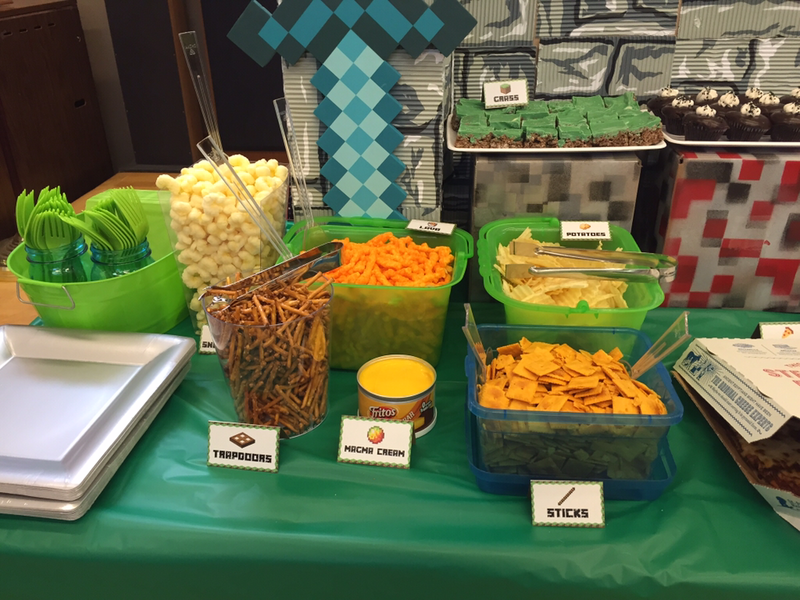 When longtime client R asked me to put together a Minecraft party for her 9 year old grandson, I had to do some research first. And by research I mean I had to buy Minecraft Pocket Edition and install it on my phone, and play for a few hours so I could get a feel for the game. I definitely "get" why it's so addictive! There is something so fun and relaxing about a world where everything fits neatly together (it was balm for my slightly OCD soul) and where you can do whatever you want, go anywhere, build anything. Since the pixelated aesthetic of the game is so well known and is part of what makes it so novel for today's kids (just look at the high quality 3-D graphics of the other games they play, such as Lego Star Wars!) I wanted to make sure to capture that in the decorations. 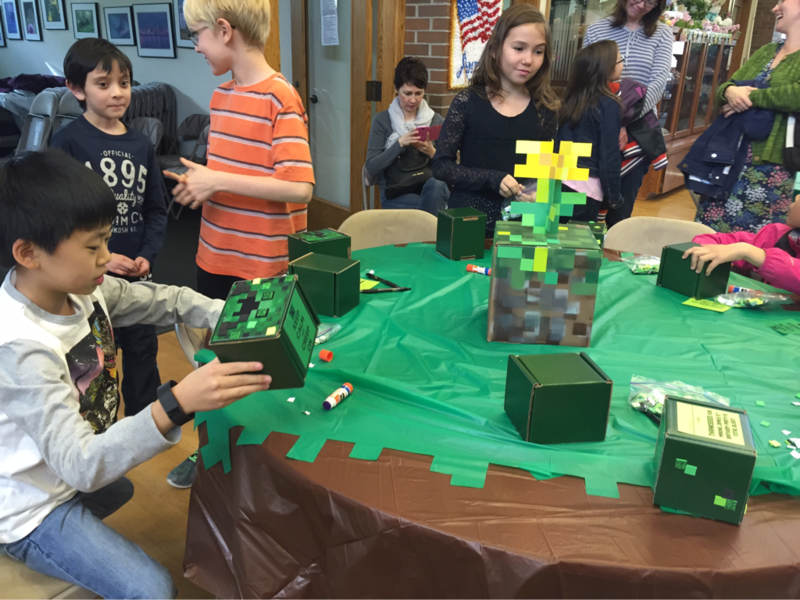 I designed and made the grass block and dandelion centerpieces, which both the kids and parents found delightful, and hand-cut the pixelated edge on the green tablecloths. Since the spot where the food buffet needed to be had no wall behind it, I also designed a freestanding "stone wall" backdrop so I would have somewhere to hang the banners and bunting, and which would work as the centerpiece of all the decor. Since so much of the game is about crafting and collecting, I decided those activities had to be a main part of the party plan. 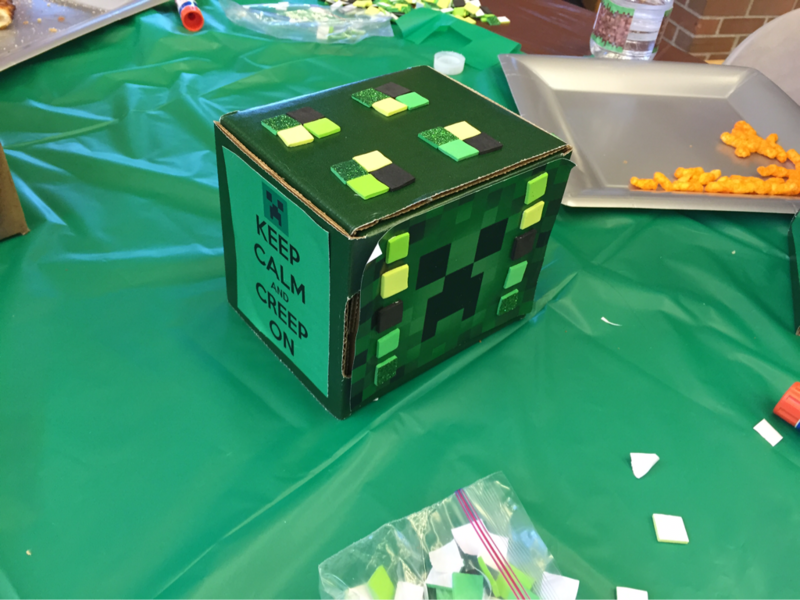 I designed a craft where the kids would decorate a "Creeper head" box, since Creepers are the most unique and well-known monsters in Minecraft. (Personally, I grew to despise them, since they would "creep" up on you while you were building or exploring, and then self-detonate in a big explosion, destroying what you were building and often killing me or my adorable blocky farm animals, too.) 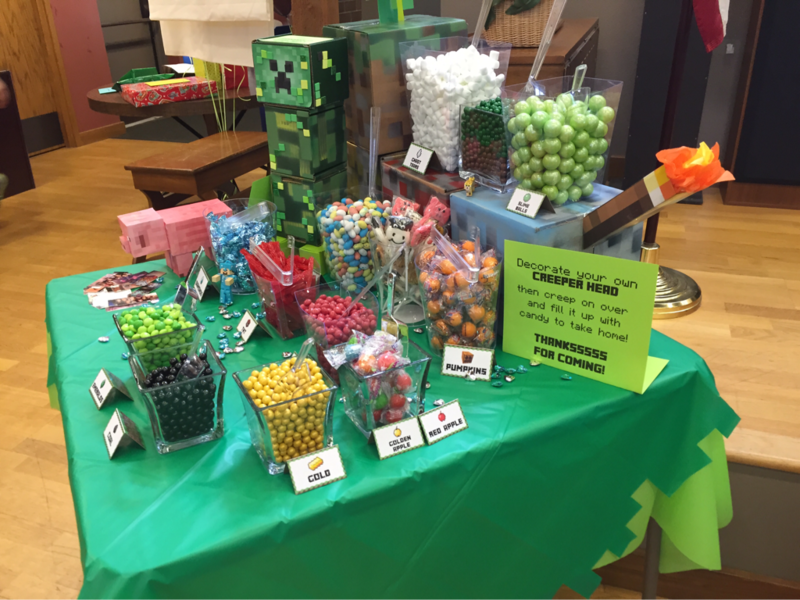 But anyway, the kids had a blast designing and creating their Creeper head crafts, and then they got to go over to the themed candy buffet and "collect" candies (with Minecraft-specific labels) to fill the box and take home. I also painted faces, which was a lot of fun. 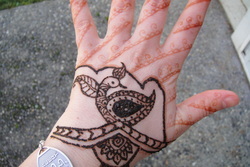 Unfortunately I was too busy painting to take any pictures, however. But let it be known I can paint a mean Creeper or Enderman! 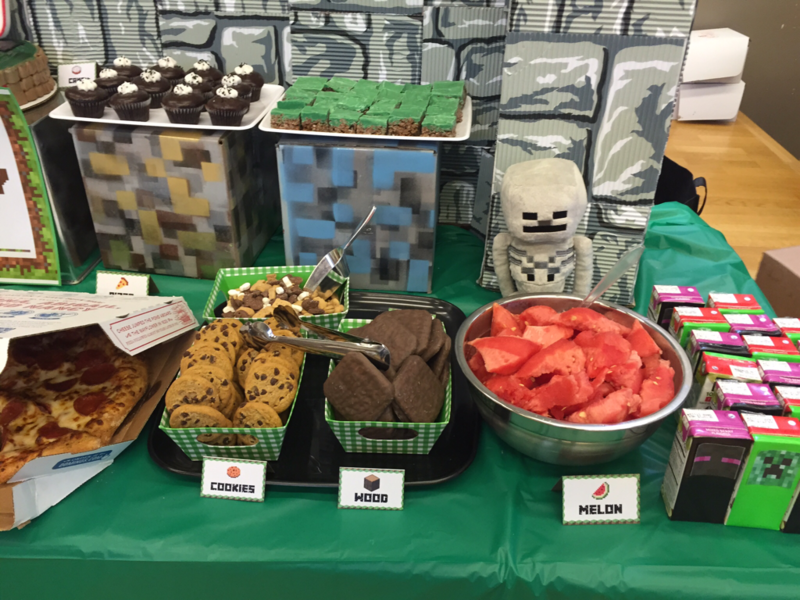 The food and snack buffet was a big hit too. 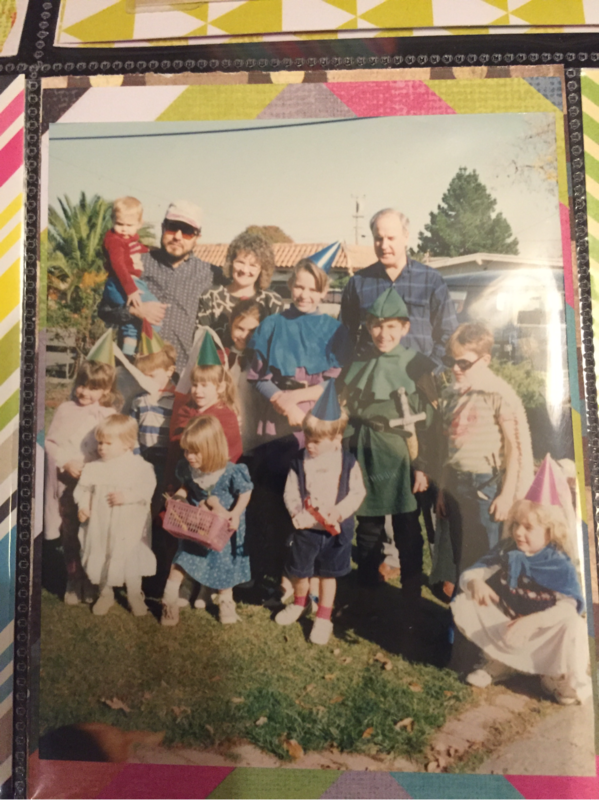 All the food was themed and kid-friendly, and the only things Grandma had to order were the cake and pizza, I brought the rest of the food and all the labels and containers and so forth. Someone swapped the labels between the "sticks" (pretzels) and the "trapdoors" (cheese crackers). Both are delicious dipped in "Magma cream" (cheese dip), however. 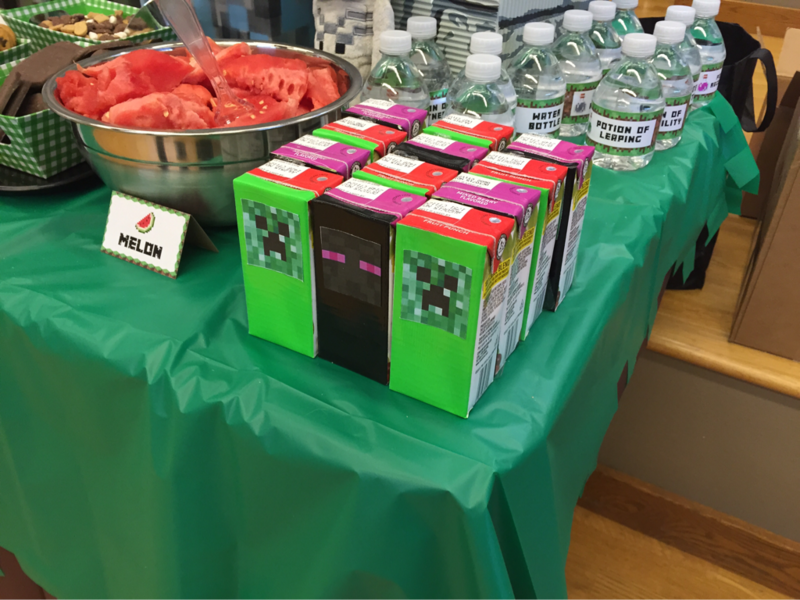 The decorated "Creeper" and "Enderman" juice boxes were fun, but the kids liked the "potion bottle" water bottles just as much if not more! 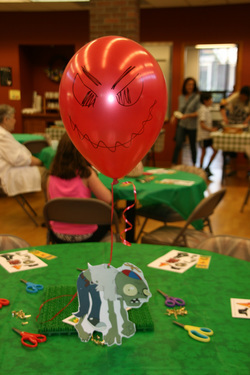 Some kids even used up space that could have gone to candy, putting water bottles in their "creeper head" to take home! 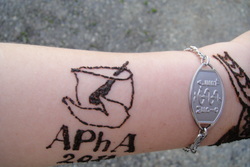 All in all it was a fun and successful party! 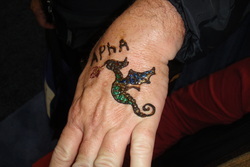 The activities were perfect for a group of 8-10 year olds. 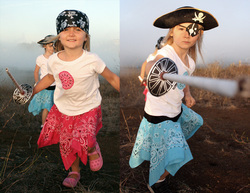 If I do this theme again for younger kids sometime, I have more ideas for active type activities which may be a better fit for a younger crowd. 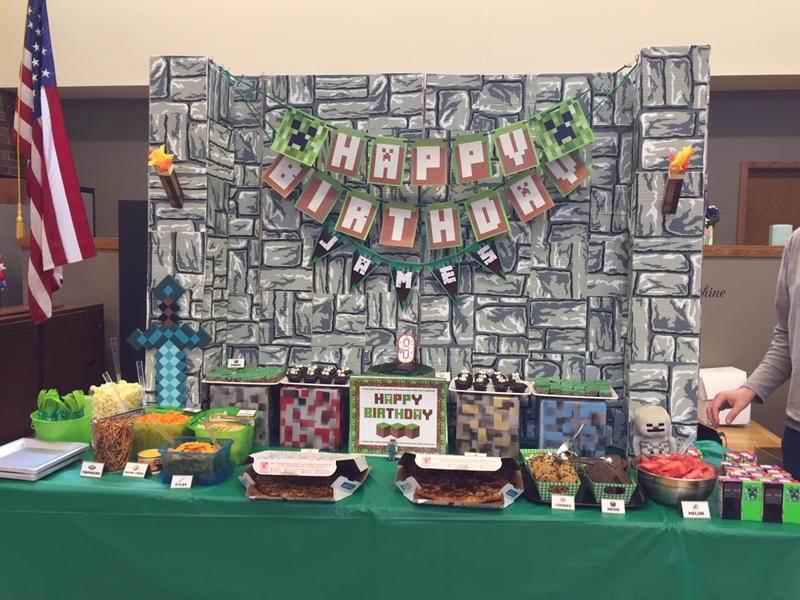 Does your child want a party based on a favorite game, book, or show? 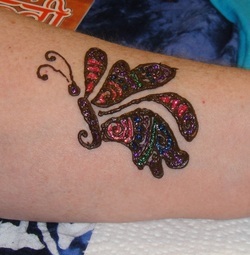 Something the party store doesn't carry? Call me, I can make it happen! 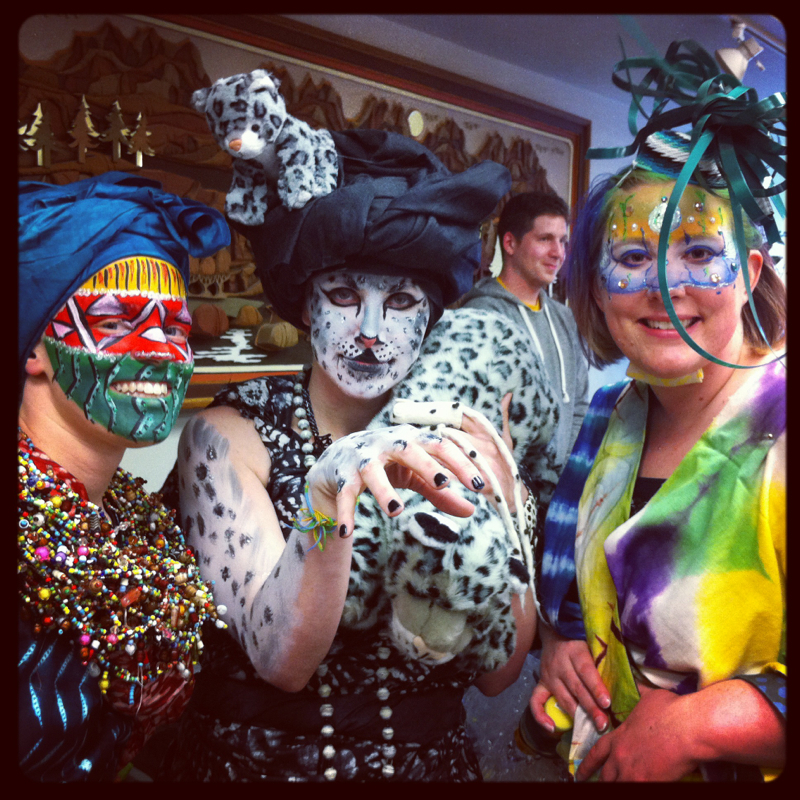 I had a great time painting these three models for the annual Edmonds Fasion Show! They were representing the Fabric of Life Boutique, which carries fair-trade handcrafted items from around the world, and is actually the outgrowth of a non-profit which supports a school for girls in Africa. More info is on their website at www.fabricoflife.org. These three models were representing various products at the boutique. The one on the left is a Global Spirit Doll. These are small beaded dolls made by girls in West Africa, for the purpose of spreading happiness! Her face is painted like one of the intricate African beads from which the dolls are made. The model in the middle is representing the products from the Snow Leopard Trust, which provides an alternate form of income from traditional handcrafts to families in the mountains of Nepal, so they do not depend entirely on raising cattle... So they do not need to hunt and kill all the endangered snow leopards, which occasionally kill some of their cattle. The snow leopard trust helps in practical ways to teach people to respect and value their beautiful native cat, while still providing for their families. The model on the right was modeling a dress made from bubble wrap, representing the many products they carry made from recycled materials, and several of the lovely handcrafted purses, wallets, and bags, made from the gorgeous fabrics hand-dyed by the girls at Fabric of Life Foundation&apos;s school in West Africa. 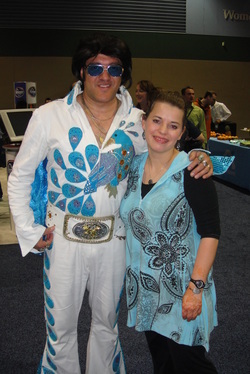 Her fanciful face design features both "bubbles" and an abstract design reminiscent of the tye-dyed fabrics featured on several of her purses. 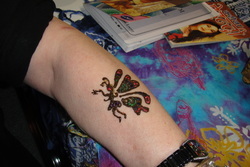 It was a very fun evening, and all three models were a huge hit!